When the library needed volunteer technology aides, Etash and Abhinav jumped right in. They both wanted to partner with the Parker branch library so they could teach computer coding to elementary school kids. 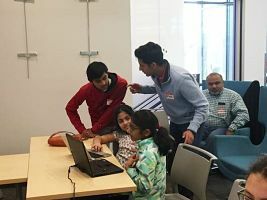 This past spring, Etash and Abhinav came together with their passion and skills to create coding classes for children. The two young men designed, organized, marketed and delivered the classes to students and their families. After they held the first class in a small conference room, they quickly realized that they would need to book a larger event hall to accommodate the size of the crowd. “Our motive was to spark an interest in kids at an early age to develop skills in computer science as it is one of the biggest emerging fields in the coming years. Coding class aims to effectively teach problem-solving skills to younger students,” said Etash. Etash is a student at Douglas County High School, founder of its Coding Club, and the vice president of Future Business Leaders of America (FBLA). Abhinav is a student at Cherry Creek High School actively involved with FBLA, as well as Robotics Club.